^ Maybe John is a little more thicc. Clothes crease less on fat people? I'm just joking. I don't think this is really a downgrade. More of a minor change. John's pistol belt isn't in the pistol belt section, only the weathered belt. If you unequip it, you lose it forever unless you patch. Something the patches actually fixed. f*ck. That might explain why my weapons compendium is incomplete. It's two items short. I think I collected all of them but I didn't bother with the optional stuff too much. I'll do an absolute complete run of the game if it comes out on PC, which is likely. 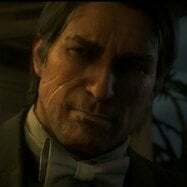 It will come out even faster now for PC due to Red Dead Online thankfully being a flop and selling WWAAAAAAAAYYYY below expected amounts of gold bars. UNLESS this months update kicks off the heavy gold bar spending that is. I was wrong about not being able to gain and lose weight in the unpatched game so please ignore that post. John's offhand holster is broken in the patched game. Guns like the Mauser awkwardly clip through it now. Ranch pants are slightly shorter in the unpatched game. Found another change. Patches can delete the individual parts of the Nuevo Pariso outfit and all saved outfits. Hi, do you know if it is possible to play the game on Xbox One X without any patches? I tried to re-install the game, turned off the auto updates, went offline, but once the loading screen started it got endless. As I own the game on PS4 Pro as well, is it possible to do it there, or it does not work either? Yes it works flawlessly on PS4 without patches. On Xbox its more complicated. You have to move all your save games to the cloud and start a new game.